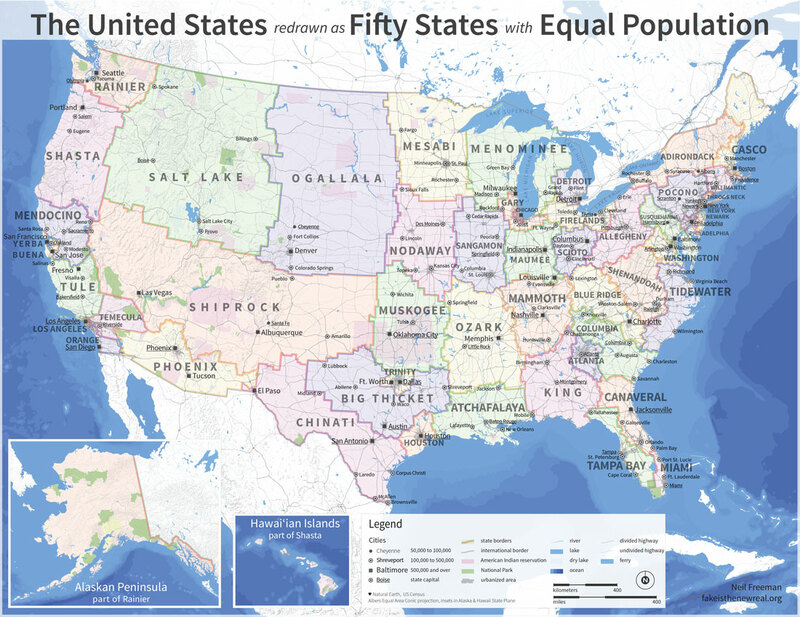 Artist Neil Freeman redrew the boundaries of the 50 United States to ensure each had an equal population. The method? An algorithm grouping counties into new states with roughly 6.1 million citizens each. The purpose? Reforming the Electoral College. Freeman insists his Modest Proposal is an art project and shouldn’t be taken seriously. Nonetheless, the redrawn map caught the eye of NPR’s Robert Krulwich. And it caught mine too — why wouldn’t it? I love maps. I don’t want to kick him too hard for this, because an art project’s an art project, but Freeman nonetheless punted on an important question: Is this map a viable solution to reform the system we use to elect the president? So I overlaid my best approximation of the new state lines over county-level data from the 2012 presidential election. But, it turns out, Freeman’s map would’ve done in 2012 what the current Electoral College has done only three times in the 56 elections American voters have used it to select their next president: override the popular vote. Barack Obama still wins the popular vote, of course, by 3 million votes. But based on my closest approximation of the map, Romney wins 26 of Freeman’s 50 “new” states — and thus, the “new” Electoral College. The American body politic has also grown accustomed to paying close attention to the popular vote. This is only rarely a problem, since the electoral college and the popular vote have only disagreed three times in 200 years. However, it’s obvious that reforms are needed. This desire for solutions to the the big, fat, obvious problems of the Electoral College has smoldered — on the left and on the right — for years. But Freeman’s “new” electoral map? Probably not the best answer. Creating fifty states anchored in large cities would actually make the system even less equitable than it is now… Why? Because cities hold such a large proportion of the population, turning the country into fifty equally populated states requires that either cities become city-states, or get split up among multiple states… Democrats win cities by a larger margin than Republicans win rural areas, so any map that divides states or districts along lines of urbanization will work to the relative advantage of Republicans. We’ve actually seen this effect before. Redrawing U.S. House seat boundaries in the 1990’s to create MMD’s — “majority-minority” Congressional districts — produced a new map, too. It was part of an effort to add to the thin ranks of lawmakers from racial minority groups. Majority-minority districts give rise to a dynamic that undercuts the very goal they are designed to achieve… When creating a majority-minority political district, the additional minority voters must come from somewhere. That somewhere is adjoining districts, which are drained of their minority voters. Those voters, though, are not merely minority voters-they are also reliably Democratic voters. And this makes it more likely that the Republican candidates will prevail in those adjoining districts. To be clear, that it hurts Democrats is not a good reason to reject Freeman’s map outright. That it overturns the popular vote, however, is a good reason to be suspect — and it’s a good reminder to electoral reformers that they’re playing with fire. Because in the name of creating a more representative map, MMD’s show us you can just as easily distort the picture as you can clear it up. That said, there’s one tantalizing upshot to Freeman’s map: It brings the electoral battleground into more Americans’ backyards. Atlanta, including the city, its suburbs, and the college town of Athens. Winner: Romney, by 18,600 votes. Menominee, which is Wisconsin, northern Illinois, and much of Michigan. Winner: Romney, by 83,800 votes. Orange, comprising California’s OC and San Diego. Winner: Romney, by 37,100 votes. Pocono, stretching from Scranton, Pa., into New York’s Hudson Valley. Winner: Obama, by 39,000 votes. Sangamon, which includes eastern Missouri, eastern Iowa, and western Illinois. Winner: Obama, by 65,900 votes. Shenandoah, running from northern North Carolina through central and eastern Virginia and West Virginia. Winner: Romney, by 62,300 votes. Shiprock — the state that geographically troubles me most — covering much of the Desert Southwest. Winner: Romney, by 57,500 votes. Susquehanna, crossing the current border of southern Pennsylvania and northeast Maryland into the Baltimore area. Winner: Romney, by 41,100 votes. Temecula, a new name for San Bernardino County in California. Winner: Obama, by 26,200 votes. Tidewater, which runs along the seashores of Virginia, North Carolina, and parts of northern South Carolina. Winner: Obama, by 80,200 votes. Tule, spanning the distance between the northern suburbs of L.A. to Fresno and just south of San Fran. Winner: Obama, by 55,300 votes. One could quite successfully argue that all Freeman’s map does in the end is move the electoral pressure points around — from Columbus, Ohio, to Atlanta; from Des Moines, Iowa, to St. Louis, Mo; from the D.C. Suburbs to Blacksburg, Va. Yet isn’t making sure urban cores don’t monopolize the popular vote at rural area’s expense one of the best arguments in favor of the Electoral College? The results in these competitive states are only the result of projecting current electoral math onto a new electoral map. Instead of pouring money into Colorado, Florida, Ohio, North Carolina and Virginia — to say nothing of Iowa, Wisconsin, or Michigan — Obama and Romney would pour that money elsewhere. With the right expenditures, it’s not hard to imagine Obama winning Chinati or Orange, for instance. Romney might have votes to gain in Tule, Temecula, or Sangamon. The data I used to conduct my analysis came from The Guardian. It wasn’t the greatest dataset — I had to fix a lot of FIPS codes and grab results myself. It also appears these aren’t final final results — the total number of votes for Romney and Obama does not equal the number of votes Politico’s up-to-date site shows. Take a look at the results as a simple spreadsheet, or at my maps — one in red-blue form, one color-coded by “new” state.